Beyond Belief: 100 Years of the Spiritual in Modern Art, jointly organized by SFMOMA and the Contemporary Jewish Museum (CJM), is on view at the CJM through October 27. Open Space presents a series of posts in which invited writers explore various aspects of the exhibition. Today please welcome SFMOMA assistant curator of painting and sculpture Rachel Federman. With its extraordinary profusion of marks, ranging from barely there to emphatically pointillist, Gordon Onslow Ford’s Seductions of the Day (1943) generates forms that are suggestively biomorphic, occupying a space that is something like a landscape, if a deeply unfamiliar one. This work’s mysteries aren’t confined to the canvas, however. Close inspection reveals that the painting is double-framed. The interior wooden strip frame unobtrusively denotes the space of the painting. While some might view frames (even very simple ones) as barriers, separating works of art from the flow of life, I prefer to think of them as aids to imaginative projection; not barriers, but bridges to be traversed. It’s something like watching the construction of the new eastern span of the San Francisco–Oakland Bay Bridge from the old one: the distance between them provided the perfect vantage from which to imagine what it would be like to travel along the new road. In turn, my experience of the new bridge will always be inflected by the memory of what it was like to see it from just outside. Similarly, the painting’s exterior wooden frame, as simple as the interior one but noticeably newer, alters my experience of the painting. But instead of drawing me into Onslow Ford’s lyrical landscape, it makes me more aware of the status of this work as an object out there, in the world. As I found out when I began investigating the story of Seductions of the Day, the painting, which was officially accessioned by SFMOMA in 1982, a bequest of the artist’s late wife Jacqueline Johnson, spent the last thirty years “out there” — finally arriving in San Francisco only last spring. A year ago its location was a mystery to us, despite its having been included in a 1985 catalogue of SFMOMA’s painting and sculpture collection. It seems inevitable in retrospect that Onslow Ford’s name came up during the planning stages of Beyond Belief: 100 Years of the Spiritual in Modern Art; in fact, it was longtime SFMOMA education curator Peter Samis who suggested him for inclusion. Born in England in 1912 and a member of André Breton’s Surrealist group in Paris in the 1930s, Onslow Ford spent much of his life investigating the metaphysical properties of art. 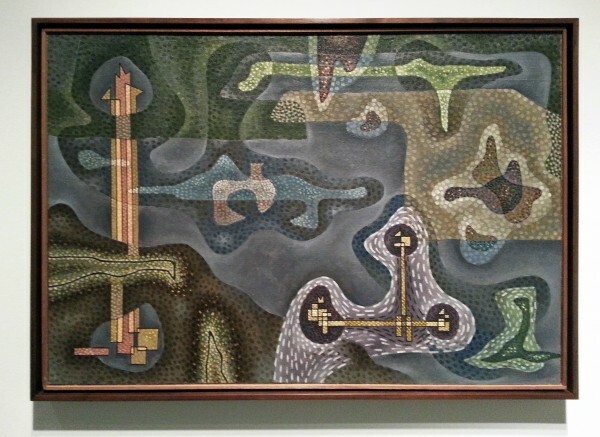 He painted Seductions of the Day while living in a remote Mexican village in the 1940s; the layered world that this painting invokes is emblematic of his efforts to render visible the invisible dimensions of the universe, or “inner-worlds,” as he called them. Although his background was international, Onslow Ford was very much a Bay Area artist. He arrived in San Francisco in 1947 and was quickly accepted by the local art establishment, exhibiting several times at SFMOMA (then the San Francisco Museum of Art) on his own and as part of the short-lived Dynaton group. 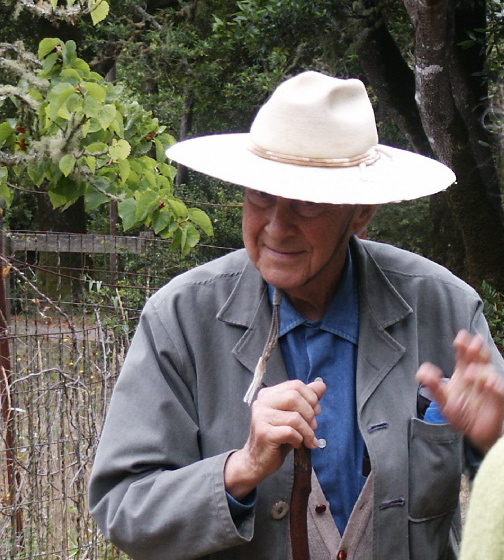 Settling in scenic Inverness, he spent the remainder of his life in Northern California, drawing inspiration from the landscape and from his encounters with Eastern art and philosophy. 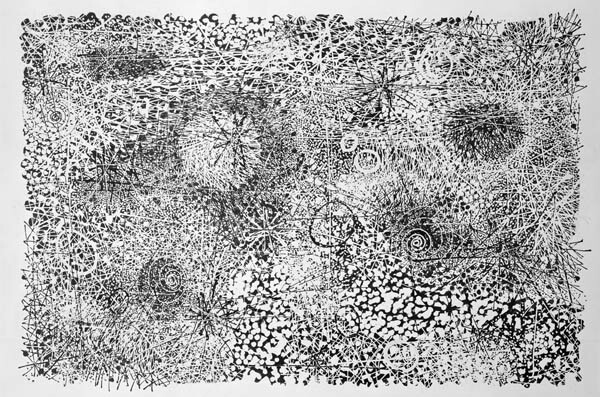 These influences are reflected in another work in SFMOMA’s collection, Constellations in Hand (1961), a large black-and-white painting created using “Parle’s paint,” a forerunner of acrylic that Onslow Ford developed with the California Ink Company in Berkeley. Hoping to include a work by Onslow Ford in Beyond Belief, if not expecting to solve the mystery of Seductions of the Day, SFMOMA curator Janet Bishop contacted the Lucid Art Foundation in Inverness last year. The foundation, which manages Onslow Ford’s estate in addition to its other activities, is directed by Fariba Bogzaran. She is an artist and dream studies scholar who co-founded the foundation with Onslow Ford in 1998, five years before his death. Bishop, together with the Contemporary Jewish Museum’s Jeanne Gerrity and SFMOMA’s Caitlin Haskell, visited the Lucid Art Foundation in November 2012. While writing this story, I came across internal museum documents dating from the 1980s indicating that when the work was accessioned by SFMOMA in 1982, it was in the hands of a Washington, D.C. gallery that could not confirm its location. Onslow Ford and the museum searched for the painting for several years, but then the paper trail goes cold. I recently spoke with Bogzaran, who met Onslow Ford many years after the bequest; she has conducted her own investigation since the November meeting. Her research has led her to surmise that at some point Seductions of the Day was returned to Onslow Ford, whose registrar may not have been aware of the history of its bequest to the museum. It was shipped to Germany for an exhibition in 1993 and traveled extensively over the next five years, appearing in numerous exhibitions in Germany, Spain, and Chile. Thereafter, it remained in a storage facility in Cologne, where Onslow Ford kept several dozen works. In 2003, Seductions of the Day and the remainder of Onslow Ford’s estate were bequeathed to the Lucid Art Foundation. After her meeting with the curators, Bogzaran, who wanted very much to honor Johnson’s wishes, promptly brought the issue before the foundation’s board, which agreed unanimously to restore Seductions of the Day to its intended home. It was through this series of events that the painting physically joined SFMOMA’s permanent collection. When I spoke to Bogzaran, she presented an intriguing proposition about the thirty-year gap between the work’s accession date and its arrival at the museum. Identifying herself as a surrealist, Bogzaran believes it may be possible that Seductions of the Day, whose figures, or “personages,” appear to be moving through an enigmatic landscape, wanted to travel around the world; if the painting had entered SFMOMA’s collection in 1982 as planned, this might not have occurred. Seductions of the Day arrived from Cologne in spring 2013, just in time for its inclusion in Beyond Belief at the Contemporary Jewish Museum. This particular moment was an unusual one for SFMOMA, however, as it was preparing to close its doors for its current expansion. When curators and conservators determined that the work needed to be reframed, they could not turn to the museum’s in-house frame shop, which was in the process of relocating. Instead, our exhibition design manager referred them to Peter Kirkeby, with whom he had worked on another SFMOMA exhibition. As it happens, Kirkeby grew up summering in Inverness, where he sometimes saw Onslow Ford wearing his characteristic Mexican Tula hat. Kirkeby’s mother, an art dealer in Palo Alto, showed works by several artists who lived on property that Onslow Ford had established as an artist’s community. In the late 1980s, Kirkeby built frames for objects in Onslow Ford’s collection, mainly small works on paper by the likes of Roberto Matta, whom Onslow Ford befriended in Paris in the 1930s. Wanting to respect the intentions implicit in the painting’s modest frame, which Kirkeby believes to be original, he chose to encompass both Seductions of the Day and its frame in a second strip frame made of walnut — similar to the original Philippine mahogany frame, but more durable. It is, he thinks, a solution that Onslow Ford would have appreciated. Rachel Federman is assistant curator of painting and sculpture at SFMOMA. Follow the Beyond Belief series here.